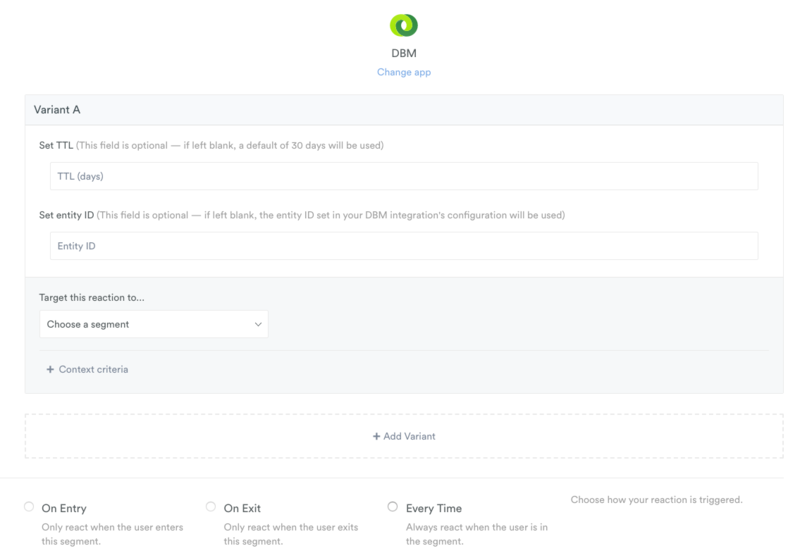 The DoubleClick Bid Manager (DBM) reaction allows you to send any of your Permutive segments directly to DBM, where you can use them for targeting on display campaigns. The DBM integration configured for your project. TTL = Time to live. This specifies the number of days until a user will expire from the list in DBM. The maximum is 540 days. If a number is not selected, the membership length will default to 30 days. Entity ID. This gives you the option to override the Entity ID set when first configuring the integration. Setting a different Entity ID allows you to send segments over to different DBM accounts on a per reaction basis. If left blank, the Entity ID initially set in your DBM integration configuration will be used. The reaction is set to fire 'Every Time' as Permutive automatically syncs segments with Google's user lists. However, the user will only stay in the Google list for as long you set the TTL (max. 540 days), while Permutive segments retain users forever (providing no time dependency is set in the segment behaviour). The chosen segment will automatically appear in the DBM UI in under 2 hours. Your segment will now be sent to DBM under the segment name, along with the segment’s code (listed under the ‘Segments’ page in the Permutive dashboard) and called 'integration code' in the Google UI.